With the right tools, and a bit of practice, applying skip trowel texture is a task nearly every homeowner can tackle. 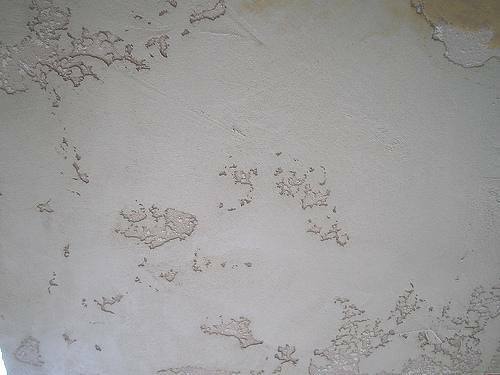 This unique drywall finish not only adds interest and character to walls and ceilings, it is also excellent at concealing imperfections. If you’re ready to finish off that recently hung drywall, or want to create a totally new look for a room, skip trowel drywall texture is worth learning more about. What is a Skip Trowel Drywall Texture? The skip trowel drywall texture is achieved when a thin drywall joint compound is “skipped” as it is pushed across a wall or ceiling with a trowel. The trowel strokes are applied in a random, arching manner which results in a rather distressed and uneven application. But don’t be fooled by what seems to be an unsystematic application. When properly applied, skip trowel texture makes for a stunning, professional drywall finish. There are many variations on this theme with as many types of skip trowel textures as there are pro’s that apply it. Prepare wall. Remove any residual dust from the wall (an air compressor or slightly damp cloth can be used.) Tip: It is important to correctly prepare the wall so the compound adheres properly. Prepare room. Protect room surfaces with a disposable plastic drop cloth. Applying skip trowel texture is a very messy job, as the compound is loose and some will drip onto the floors, walls, and furniture. Tip: Do not skip this step. Take your time to do a comprehensive job of protecting all surfaces- trust me, it is time well spent. Prime surfaces. This isn’t absolutely necessary but a good idea. 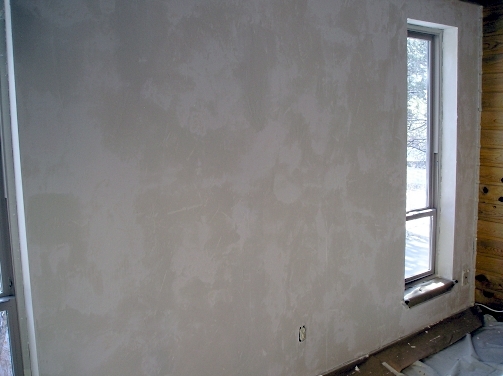 Priming before applying texture helps to promote even drying and limit the shrinkage of the drywall mud. Use a good acrylic PVA wallboard primer. Mix compound. In the 5 gallon bucket, mix joint compound with water until it is the consistency of a think paint. It should not be stiff, but it should not be watery. Remember, you’ll need the compound to hold shape as it hardens. If it’s too loose, it will only drip (sag). Too stiff, and it won’t spread properly. Tip: Only prepare a small batch of compound at a time. It dries quickly. Apply to wall. Pour compound mixture into the mud pan, and work a small amount of compound onto the wide edge of the trowel. Work the mixture from the floor to midway up the wall, then midway to ceiling. When applying skip trowel texture to a ceiling, work from one side of the ceiling across to the other. Position the trowel at about a 15 degree angle and push the compound along the wall in short, random, arching movements. A quick bend of the wrist works great to achieve just the right skip trowel texture. Remember to “skip” the trowel off the surface as you move it. Tip: Work on small sections of wall at a time. Patience is key to proper application. Knock off. Depending on the temperature and humidity in the room, you’ll need to wait for a few minutes for the compound to start to set before you “knock off.” Just as you see the skip trowel texture starting to dry, you’ll want to revisit the surface and use the trowel to “knock off” any areas where the compound is dropping. Also check for areas where the texture is significantly thinner than the rest of the wall, and use trowel to thin. Tip: Let the surface dry for at least twenty-four hours before applying paint. Even among professionals, the finished look of skip trowel drywall technique is not identical. That’s because everyone uses a touch of creativity when applying skip trowel texture- which results in individual styles. The key to success? Nail down a method that allows you to work quickly, while also performing the skip trowel technique properly. Once you find a style of application that works for you, stick to it. Consistency is essential to the spectacular skip trowel drywall texture you’re looking for.